EVOCam is developed to provide dental professionals with innovative digital milling technology using better materials to provide customers with a superior product. evoCam discs are made of Polymethacrylate with Microfilled Composit and Organically Modified Fluorescent Ceramics. and shapes. 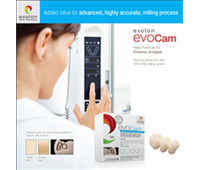 evoCam is designed for the manufacture of medium and long-term aesthetic restorations. giving it a perfect natural look. The sum of its properties makes it a perfect product for long-term restoration products. making a larger range of restorations and optimizing the final product to prosthetic requirements.